Tyrone Hospital – TLC for Angels – Charity group crafting handmade knit and crocheted baby clothes and items for preemies and hospital confined children. "The Tyrone Hospital presentation was a huge success. We donated over 670 items and the expressions on the faces of the hospital's auxilary members, the hospital's administration, and the hospital's staff was priceless! 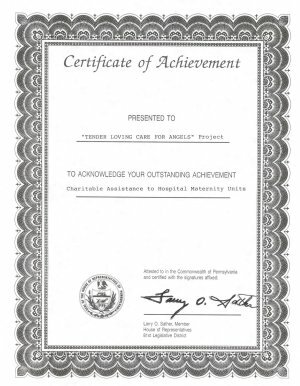 It is such a rewarding experience to witness and be a part of that no words can truely express the feeling you get knowing precious babies will receive something special from TLCforAngels." Now that I have finally caught my breath and have had a chance to collect my thoughts......I am going to share my thoughts on the Tyrone Presentation. My drive to Pennsylvania was very pleasurable since I had Murf with me in the car. We arrived in State College at the hotel we were going to be staying in...checked in...called Julie and arranged for her to meet us at a landmark that I was familiar with from being there once before, so she could steer us in the rest of the way to her house. Everyone that attended the presentation were just in awe at all the items...kept remarking how wonderfully made everything was......how exciting to know that many babies were going to be dressed in such finery....how generous and loving each and everyone of you Ladies were....how amazing and so hard to believe that complete strangers would take such an interest in the well being of people that they don;t even know. They were especially amazed to learn that it was thru connection on the internet..that everyone was so far apart from each other but still be able to work hand in hand together in unison. Murf and I returned to our hotel later that evening to get ready for our trip back to NY and NJ.....we hated saying goodbye to Julie, would have like to have stayed longer that evening, but we all needed some down since we had been hyped up all day.......I think we all had many thoughts and emotions running thru us with the memories of what transpired that day. Great job Ladies!!!!!!!!!!!!!! Thank you so much for your never ending generosity!!!!!!! !